Two strange press conferences. Casey Affleck – Bens younger brother – explains, why he decided to film during his brother-in-law Joaquin Phoenix is kind of going crazy. “Sometimes”, says Affleck, “you have a dream. A woman on that hill, a stain on that pillow. And then… you just want to follow this feeling. That’s what stands at the beginning of every film and that’s how I decided to do this film”. It comes out, that crazy Joaquin is hiding some place in Venice. Not sure if he comes to the official screening of “I am still here” and apparently Casey haven’t seen him either yet. “I am still convinced, that his being some place here means that he wants to support the film”. There is a lot of physical resemblance between Joaquin and his actor colleague Vincent Gallo, who is starring in the new film of Skolimowski. Also Vincent is some place around. He is presenting also a film he directed later in the Venice programm. 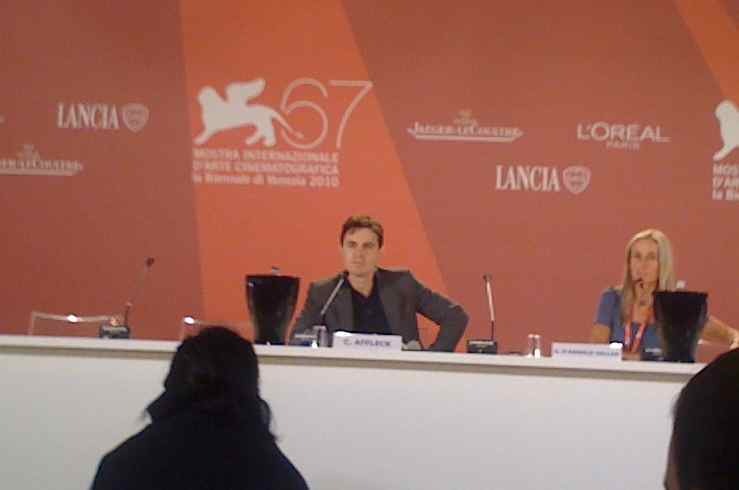 Skolimowskis producer says, he met Vincent at the Darsena yesterday and asked him to come to press conference today. “I am doing no press conferences”, said Gallo. “Not even for my own film”. Skolimwski is revealing, that Gallo was using “a kind of acting method” while shooting the film “Essential Killing”. A he is playing a man who is surrounded by enemies, he was trying to anthagonize every person he met during the shooting of the film, so he could feel really alienated from his surroundings. “Believe me”, explains old Mr. Skolimowski in his friendly way, “I am still describing it in a very diplomatic way”.